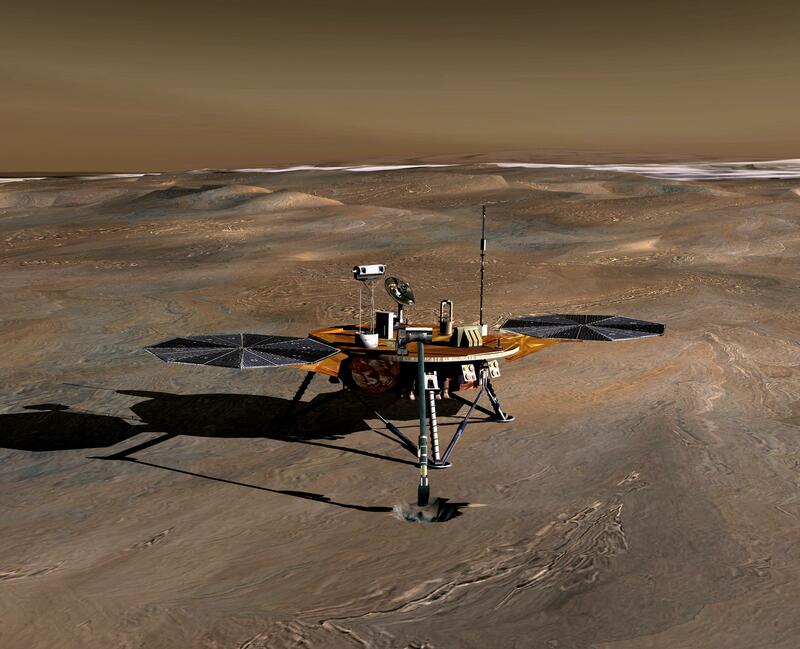 Artist's rendition of the Phoenix Lander on Mars. The robotic arm is in front of the lander in this image. Click here for a high-resolution version. Image Credit: NASA/JPL. The mission found water-ice, perchlorate, calcium carbonate, clouds and snow of water, and non-magnetic dust. For a list of important papers about the results from the Phoenix mission, see Key papers. Each paper loosely corresponds to one of the sections below. The TEGA instrument can be seen in the center and right foreground of this mosaic of images showing part of the Phoenix deck after sample deliveries. Click here for a high-resolution version. Image Credit: NASA/JPL-Caltech/University of Arizona/Texas A&M University. The Phoenix mission did find water-ice in the Martian subsurface. Using the lander's robotic arm, a shallow ice table was uncovered at depths between 5 and 18 cm. An instrument called TEGA, short for Thermal and Evolved Gas Analyzer, verified that the soil samples collected by the scoop on the arm contained water-ice. The TEGA instrument has a small oven used to heat the soil samples, while measuring the amount of power needed to maintain a steady rise in temperature. A small increase in this power consumption with an onset at about -2°C, consistent with the melting of water-ice, provided conclusive evidence of water-ice in the soil. In addition a connected mass spectrometer was used to verify the presence of OH- and H+ ions in the evolved gas. Phoenix also somewhat unexpectedly found oxidative perchlorate ions (ClO4-) in the soil. Oxidants on Mars were detected already by the Viking missions in 1976, but specifics about their identity were unknown prior to the Phoenix mission. At high temperatures perchlorate easily oxidizes organic compounds, which makes detection of any such compounds in Phoenix's TEGA oven difficult, because the oxidative power of perchlorates strongly promotes combustion of organics. Alkaline earth perchlorate salts such as Mg(ClO4)2 and Ca(ClO4)2 are deliquescent, i.e. they absorb moisture from the air and dissolve in it. They can also lower the freezing point of water considerably. When dissoved in water in the right proportion the resulting solutions have freezing points in the range down to -70°C. This may enable the formation of liquid solutions, perchlorate brines, and lends support to the conjecture that such brines may be responsible for gully formation on Mars. The strong water affinity of perchlorate makes it strongly desiccating, drying out its surroundings and thus inhibiting many forms of life. On the other hand, for certain microorganisms perchlorate can serve as an energy source. Several such organisms on Earth are known to harvest energy from perchlorate molecules by use of anaerobic reduction. Perchlorate salts might also play an important role for human exploration of Mars, as the highly metastable, fully oxidized molecule at high temperatures can be used for rocket fuel and for generation af breathing oxygen. The MSL rover Curiosity, operating much closer to Mars' equator, has also found perchlorate, showing that its presence is not limited to the polar regions where Phoenix landed. Carbonates are generally products of processes that involve liquid water. The amount (3-5 weight percent) of calcium carbonate found in the soil by Phoenix is most consistent with formation in the past by the interaction of atmospheric carbon dioxide with liquid water films on particle surfaces. Nonaqueous processes that can produce carbonates have reaction rates that appear to be far too small to account for the amount of carbonate detected, thus suggesting that Mars had periods with wet or damp soil in the geologic past. Clouds of water-ice as well as precipitation of ice crystals toward the ground were observed with the Phoenix mission's light detection and ranging (LIDAR) instrument, which emitted pulses of laser light upward into the atmosphere and detected the backscatter from dust and clouds. Other measurements indicated that the lower part of the atmosphere (up to a height of about 4 kilometers) was well mixed by summer daytime turbulence and convection, leading to the interpretation that water vapor mixed upwards during daytime forms ice crystal clouds at night, which then subsequently precipitate back toward the surface. 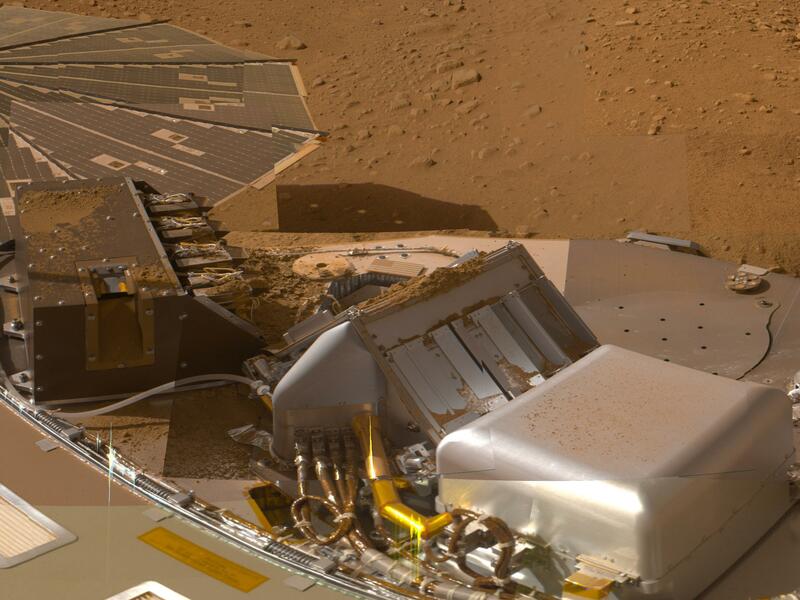 Spectra of the previously elusive non-magnetic dust particles in the Martian atmosphere were extracted from data from one of the magnetic properties experiments that the Niels Bohr Institute Mars group delivered to the Phoenix mission. The improved sweep magnet experiment iSweep as it was called was designed, among other things, to prevent magnetic dust particles from settling in certain small selected areas in order to detect whether the atmospheric dust has a component of non-magnetic or very weakly magnetic particles (only particles with magnetic susceptibility χ ≤ 10-3 were able to settle in these small areas). The Phoenix iSweep experiment for the first time found these particles to exist in the atmosphere. The iSweep experiment also functioned as calibration target for the Surface Stereo Imager camera. Read more on that on the Phoenix main page in the section 'Payload with Danish contributions' and on the CalTarget/iSweep page. The main results of the Phoenix mission argue both for and against the landing site as a place habitable for life in past or present times. The presence of water-ice and the indication by calcium carbonate of a wetter past are arguments for habitability. So is the possibility of certain microorganisms harvesting energy from perchlorate, possibly within liquid brines existing at low temperatures, as low as the average surface temperature of Mars. Because perchlorate, albeit an oxidant, does not readily oxidize organics under Martian conditions, such brines might be habitable even to other kinds of microorganisms. On the other hand, the water affinity of perchlorate and the resulting strong desiccating effect of the substance argues against the Phoenix landing site as a place habitable for life. In addition, the particle size distribution (PSD) of the soil at the Phoenix landing site suggests a dry history at the site, with very brief cumulative exposure to liquid water. The PSD of the surrounding soil was determined from data from optical microscopy and atomic force microscopy from the Phoenix lander. The analysis of the data revealed two size populations, indicating a single method of production for the population of smaller particles, ranging up to 11 μm in size. This is much larger than clay-sized particles formed by interaction with liquid water, which only grow to sizes of about 2 μm. This suggests that this population (up to 11 μm) predominantly is a product of weathering by the wind under very dry conditions. The extent of past interaction of the soil with liquid water is reflected by the fraction of clay-sized particles contained in the soil. The very low proportion of these found in the soil near the Phoenix lander has been used to estimate that the soil has been exposed to liquid water for much less than 5000 years in total, during a history that extends at least 600 million years back, to the impact event that created the nearby Heimdal crater.